Mill Street is Toronto’s first commercial brewery to open in more than 100 years. Opened since 2002, Mill Street has made a name for itself with their innovating craft brews. 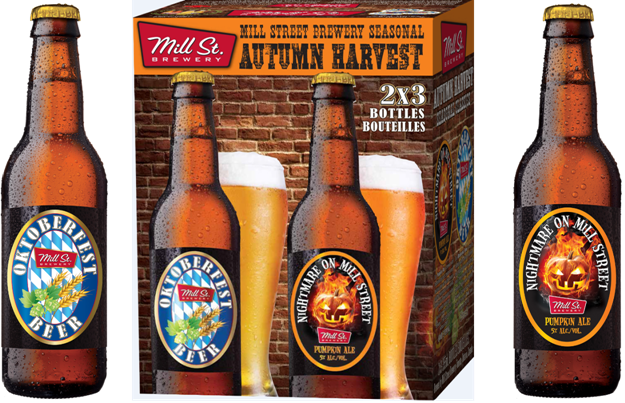 Their latest offerings – Nightmare on Mill Street Pumpkin Ale and the Oktoberfest Beer will only be available in BC until the end of October. This spicy pumpkin beer has a creamy head brewed with a blend of 5 malts (pale malt, wheat malt, biscuit malt, caramel malt and chocolate malt). Nugget hops are used for balance and a blend of 6 spices and a touch of vanilla makes this beer super smooth with a spicy aroma that carries hints of ginger and clove and a lingering pumpkin aftertaste. This beer is paired perfectly with your Thanksgiving turkey, or a hearty, spicy chilly. A traditional Bavarian lager, this beer is brewed with a blend of German pilsner and Munich and biscuit malts. The malts give this brew a rich golden colour, and a heavier malt taste. This beer will be a favourite for the more discerning palates. German Hallertau variety of hop is used throughout the brew to balance the malt sweetness and create a rich complexity that is typical of this Old World style. This beer is paired well with cheese plates (specially gouda, brie and havarti) as well as roasted vegetables.